Uncle Richmond helps Pa with a little problem with his computer... so I decided that he ought to be rewarded. 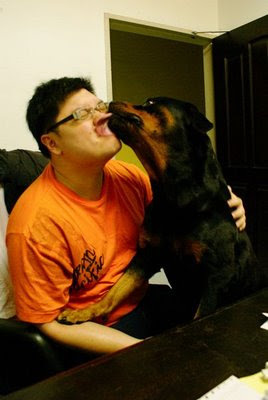 "If a Rottweiler wants to lick me, I am not going to say No." I think he means it in a good way yah? We were at the Doggie Pool on Sunday and again, Bruno is bitten on his side. It was unprovoked. The doggie in question was 八宝 or "Eight Treasures" in directly translation. A pretty big mongrel dog that was skittish from the beginning. Bruno as usual was totally playing once we reach the pool, and all of us observed 八宝 to be growling, showing teeth and snapping at every dog there. The guy that seemed to be scolding 八宝 was really not very firm at all. 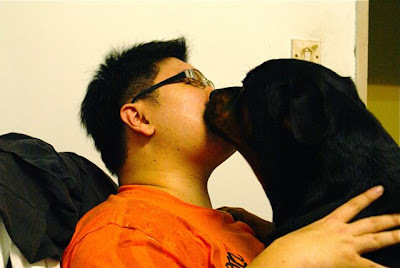 After approaching him, and teaching the guy's smaller dog how to swim, Pa wanted to tell him that 八宝 was really about to go out of control when it happened. 八宝 turned and bit down at Bruno, but proudly, Bruno did not retaliate. He barked really loudly back at 八宝 but 八宝 didn't let go. A few seconds later as the humans approached the pair, 八宝 let go and moved away. Bruno took a grand total of 3 seconds before shot off to play ball with other dogs and humans. Pa was really pretty mad. He approached the owner who he realised was a very quiet female sitting at the benches. He explained to them that it was really just not FAIR for Rotties at all. If Bruno had not been trained to be calm and confident, a fight would have ensured. Bruno would not be dumb enough to not protect himself. However, should Bruno protect himself, it is obvious really who would win the fight. 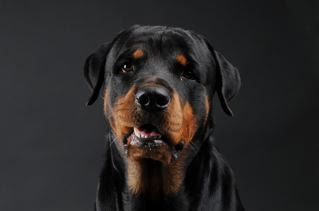 It wouldn't matter who started the fight anyway... it would be the Rotties fault always. 八宝 was wearing a Half Choke like the one in this picture... however, it was a totally wrong size. When the chain is pulled, the two ends of the collar actually meets, hence any correction or effect is totally lost. Pa told the owner and the guy to sit and stay their dog. They were unable to do so at ANYTIME. 八宝 could not and will not pay any attention to his owners... I have a feeling he thinks he is really the boss. Pa then told them off in pretty harsh terms. Honestly I would have done worst as 八宝 tried to bite me as well, I showed to him i'm not as easy as Bruno, though i did not attack him. Pa then told them if they appear again without a full choke and a muzzle, he will approach them again. He proceeded to teach them how to train 八宝 and what is muzzle training. Pa is sure that its over a 90% probability that they would not listen to him. 八宝 's owner hardly reacted as Pa spoke. As if she ignores him long enough, he would suddenly disappear into thin air. Even after the lecture, the guy leashed 八宝 to the pool, and 八宝 was attacking other dogs. Pa said really loudly to no uncertain terms.... "Please do not bring your dog over to swim. Your dog is NOT ready for this." Then they left shortly after. A little harsh? Maybe. 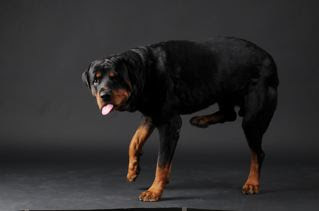 But no one was going to side the Rottie should another accident happen. We also met Chris with his new Female baby Rottie... we will meet up with him soon and get to know the pup a little better!!!! Eh? I didn't think your Pa was harsh towards them at all. In fact I think your Pa was trying so hard to be civilized. Sigh, poor thing. its like being the alpha of the place... like its our own... and dictating who gets to play in the pool... isn't that a little harsh? hey for what its worth I thought that what you did was fab. The owners ought to learn to understand their dog and to handle him/her. And it's true that he/she shld not be getting into the pool when he/she is in a growling, snapping state. Highly doubt that the dog will enjoy the swim anyway. And it is a danger to other dogs there as well. 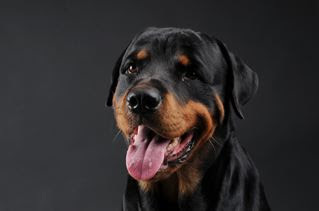 And truly 2 thumbs up for your rotts. and where is the management staff of the pool throughout all this? should they not be the ones to maintain order & peace there? poor bruno - is he ok? The management should not be held responsible for whatever happens there... it is really up to the owners. How else to keep the peace? Your Pa definately did the CORRECT thing, there's nothing harsh on what he says at all if the owner choses not to listen & does not apologize. will u help me teach Kayla to be calm? she's as skittish as a deer, very timid. hi bear, did u get my email? unfortunately i have not yet received anything! please email me again!